Candice Kristina Patton (born June 24, 1985) is an American actress. 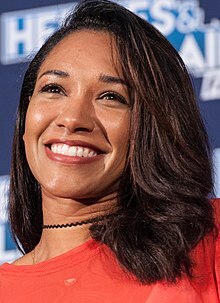 She is best known for her role as Iris West in The CW television series The Flash and as her recurring role as in the BET television series The Game. Patton was born in Jackson, Mississippi on June 24, 1985 but raised in Plano, Texas. She graduated from Plano East Senior High School in 2003, and later attended Southern Methodist University in Dallas, graduating with a BFA in Theatre in 2007. In May 2004, following her first year in university, Patton took part in CBS' Soap Star Screen Test, a nationwide audition contest for university students to win a role on the soap opera The Young and the Restless. Patton won the contest alongside Iman Nazemzadeh. In 2008, Patton had a starring role in The WB's web series Sorority Forever and a role in the independent film Commander and Chief. Patton was cast for many television series including the soap opera The Bold and the Beautiful. She currently portrays Iris West in The Flash for The CW since 2014. The role has led to appearances on other Arrowverse shows including Arrow, Supergirl and Legends of Tomorrow for the Crisis on Earth-X crossover event. In the third season episode "Duet", she played Millie Foss, the daughter of gangsters, in a dreamworld scenario. In 2017, her role as Iris West garnered her a Saturn Award for Best Supporting Actress on Television. In 2017, along with her Arrowverse co-stars Patton co-founded Shethority ("She + Authority"), an online global collective described as "a positive place for women and the feminine to inspire, empower, and share." Active members of the initiative include Melissa Benoist, Chyler Leigh, Caity Lotz, Maisie Richardson-Sellers, Tala Ashe, Emily Bett Rickards, Juliana Harkavy, and Katie Cassidy. Through social media, women share their own stories and experiences on dealing with self-acceptance, homophobia, sexual harassment at the workplace and so on. Shethority has its own clothing line, from which all the money collected will be donated to non-profit organizations fighting for girls and women rights, such as Girls Not Brides and Girls, Inc..
2007 The Bold and the Beautiful Candy Episode: "#1.5202"
2008 Casanovas Actress #2 Episode: "Hollywood Heartburn"
2009 Castle Young Woman Episode: "Inventing the Girl"
2010 The Forgotten Kelly Episode: "Double Doe"
2010 Grey's Anatomy Meg Waylon Episode: "Almost Grown"
2011 Harry's Law Denise Raines Episode: "American Dreams"
2011 CSI: Miami Wendy Gibson Episode: "Blood Lust"
2011 Love Bites Liz Beth Episode: "Modern Plagues"
2012 Rizzoli & Isles Mrs. Avery Episode: "This Is How a Heart Breaks"
2017 Supergirl Episodes: "Crisis on Earth-X (Part 1-2-4)"
^ a b "Patton Website". candicepatton.com. Archived from the original on December 30, 2013. ^ Crean, Ellen (May 21, 2004). "Screen Star Votes Being Counted". CBS News. Retrieved June 24, 2018. ^ Morales, Tatiana (May 14, 2004). "'Y&R' Hunts For New Soap Star". CBS News. Retrieved June 24, 2018. ^ Morales, Tatiana (May 24, 2004). "Iman & Candice Win' Y&R' Roles". CBS News. Retrieved June 24, 2018. ^ Carr, Lauren (August 20, 2008). "The WB is back starring Plano graduate!". Plano Star Courier. Retrieved June 24, 2018. ^ Andreeva, Nellie (March 14, 2014). "Candice Patton Cast In CW Pilot 'The Flash'". Deadline. Retrieved March 4, 2014. ^ a b McNary, Dave (March 2, 2017). "Saturn Awards Nominations 2017: 'Rogue One,' 'Walking Dead' Lead". Variety. Retrieved March 2, 2017. ^ "Shethority Twitter Page". candicepatton.com. October 2017. Retrieved June 24, 2018. ^ "Shethority International Women's Day Apparel". ^ "SHETHORITY "We Got Your Back" Collection". ^ "Wave 2 Nominees". Teen Choice. Teen Choice. July 7, 2015. Archived from the original on April 11, 2016. Retrieved July 9, 2015. ^ Ceron, Ella (June 19, 2017). "Teen Choice Awards 2017: See the First Wave of Nominations". Teen Vogue. Archived from the original on June 20, 2017. Retrieved June 19, 2017. Wikimedia Commons has media related to Candice Patton.